Well that was kinda BORING. 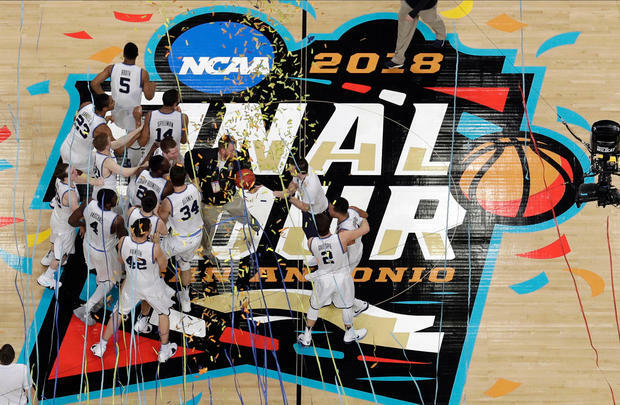 The Villanova Wildcats DESTROYED the Michigan Wolverines to win the 2018 National Championship and it was NOT close. Villanova has WON all SIX of their games in the Tourney by DOUBLE digits and they looked like a COMPLETE team in ALL facets of the game throughout the Tourney. Villanova has now Won TWO of the last THREE National Championships and are the JUGGERNAUTS of College Basketball. Michigan got off to a GOOD start in the game while the shots were NOT falling for Villanova. As soon as the Wildcats were able to get some points on the board, they started ROLLING led by guard Dante DiVincenzo who had the BEST National Championship game EVER for a player coming off the BENCH. Villanova has been DOMINATING College Basketball for the past THREE seasons and their head coach Jay Wright has to be considered as ONE of the BEST coaches of College Basketball history, the Wildcats are going to retain MOST of their players next season so I would NOT be shocked if they are BACK at the Final Four next season. Throughout the season we did NOT have a GREAT team and the National Champion ended up winning all of their BIGGEST games by DOUBLE DIGITS and looked GREAT, so there was NO parity at the END of the season. This is the FIRST time in HISTORY that the Super Bowl winner and the National Championship winner comes from the same city. The Philadelphia Eagles WON the Super Bowl in February and now Villanova a SUBURB of Philly is on TOP of the College Basketball world. Are the 76ers and Flyers next to get a championship for Philly? This ENDS the College Basketball season and I no longer I have to PRETEND that I know anything about College Basketball. See you NEXT MARCH!